Coarse & Match Fishing Monthly – the free-to-view video magazine for dedicated coarse and match anglers – has now made its releases available on i-phones and i-pads. 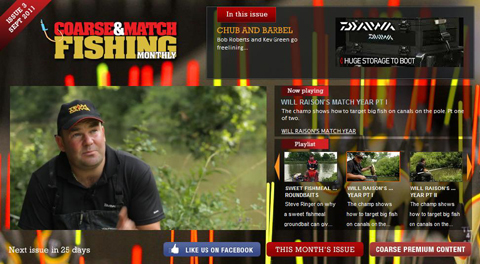 The latest issue contains about three hours of video including tips, tackle, advice and great action from some of the sport’s top names, and is now viewable FREE TO VIEW through the web browser on Apple devices by going to http://www.coarseandmatchfishing.com/ . The video magazines can be viewed on a good 3G signal, although is likely to be better on wireless connections. Highlights of the current offering include Will Raison on catching big fish from canals, Steve Ringer talking about fishmeal groundbaits, Bob Roberts freelining for chub and barbel, Gareth Purnell on fishing the pellet waggler, classic Fish O Mania and World Championships action, catfish hints and tips with Simon Clarke and a guide to Irish angling with Ian Kitson.